Eden Hazard is among the best players in the world with his ability to produce ‘magic moments’ in games, according to his Chelsea team-mate Ross Barkley. Hazard replaced Barkley as a substitute during Chelsea’s Carabao Cup encounter with Bournemouth on Wednesday. 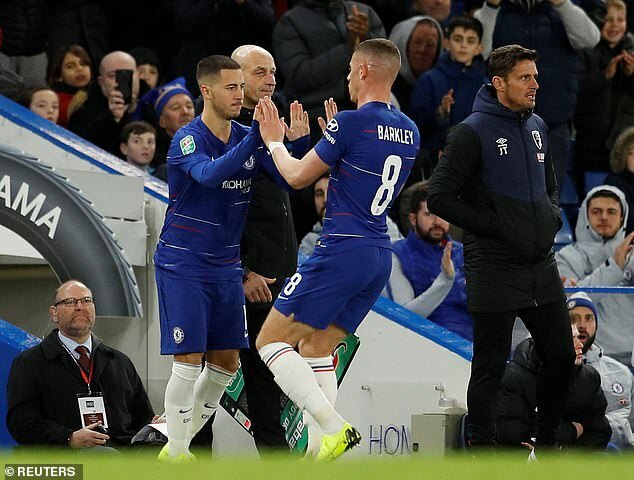 He scored a late winner to secure a 1-0 victory, a goal Barkley said was always likely to come given the way the team were playing, and the quality Hazard possesses. Barkley told the Chelsea club website: ‘The way we were playing you could see we had the belief a goal was going to come. Eden got that goal and he can produce magic moments like that, and the team stuck at it and we came away with the win. ‘Eden is playing very well at the moment, he is up there with the best in the world and he is capable of producing goals like that, like he scored in a previous round against Liverpool, and to play with a player like that is fantastic. ‘He is relaxed but once he is on the training pitch he is magical. He plays with enjoyment but he scores goals and he creates goals and he is a pleasure to play with. It continues Hazard’s superb scoring record against Bournemouth – he has seven strikes in his clashes with the Cherries for Chelsea. Hazard’s goal sends Chelsea into the semi-finals, where they will play Tottenham Hotspur over two legs in January. They join holders Manchester City and surprise package Burton Albion, who face off in the other last four tie.